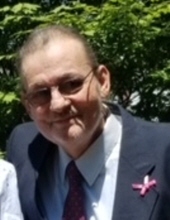 Manuel J. Orosco, age 64, of Knox, passed away at his home on Sunday, March 31, 2019. Manny was born on August 11, 1954 to Manuel and Emily Pedroza Orosco. He was a Veteran having served in the U.S. Army and had worked many years as a welder. On Valentine Day 2003 he married Pamela Melton Orosco, she survives. Also surviving are his children, Joe Liebno of Atlanta, Georgia, Manuel J. Orosco II of Birmingham, Alabama, Manuel “Joe” Orosco III of Sheboygan, Wisconsin and Jodi Liebno of Atlanta, Georgia, brothers and sisters, Diane Storino of Munster, IN, Carol Mackey of Munster, IN, Ronald Orosco of Hammond, IN, and Linda Orosco of Hammond, IN, grandchildren, Alexia, Louis and Neveah, and a grandson, Deveon Rios of Wheatfield, IN. He was preceded in death by a granddaughter, Angela. No services are planned at this time. To send flowers or a remembrance gift to the family of Manuel J. Orosco, please visit our Tribute Store. "Email Address" would like to share the life celebration of Manuel J. Orosco. Click on the "link" to go to share a favorite memory or leave a condolence message for the family.